Hope you are having a wonderful week. 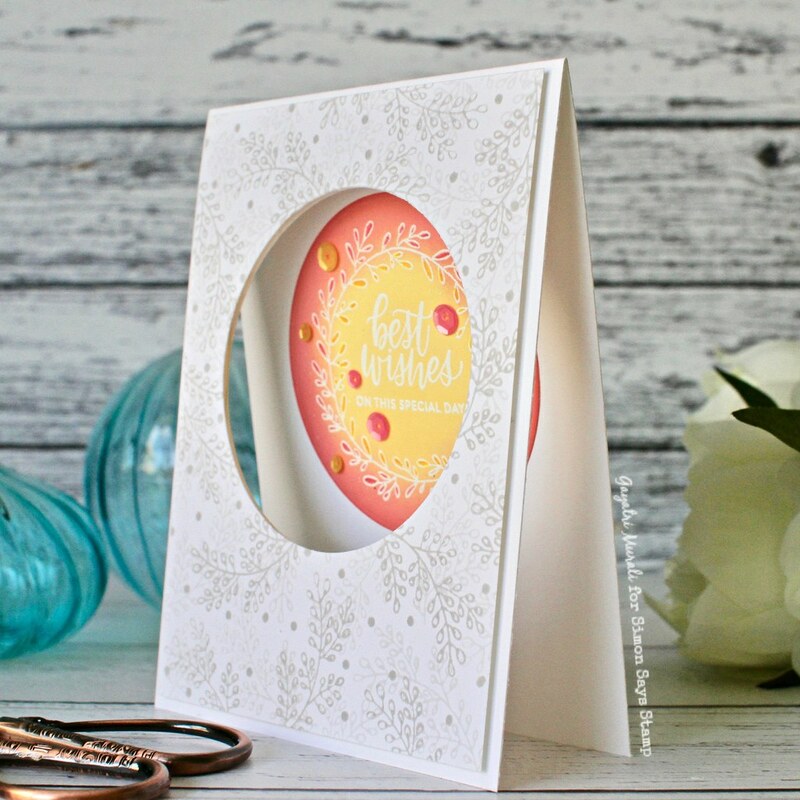 I have another card share for you today using Simon Says Stamp Sending Sunshine release. 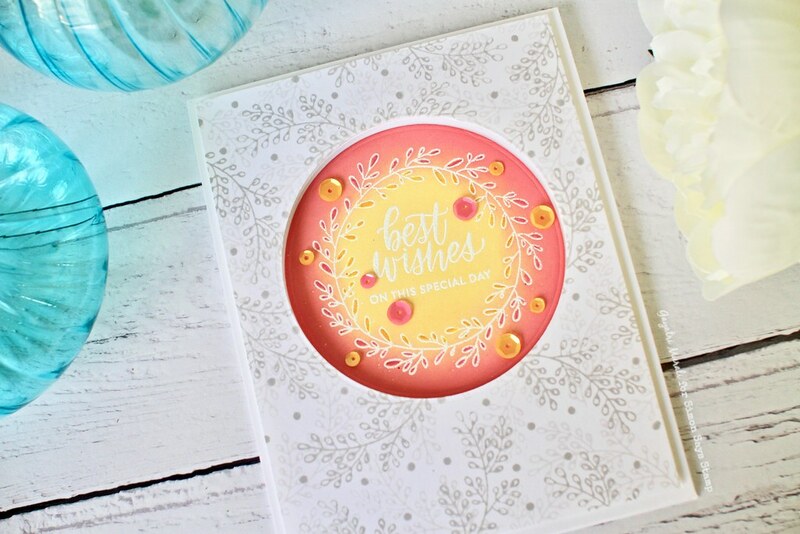 I used the delicate and beautiful Wreath Greetings stamp set. This set has coordinating dies but I did not have it when making this card. I have made a window card today to add dimension to the card. I started with trimming a white card panel to 4’x5.25′ in size. I temporarily adhered this panel to the white card base on the centre. Then used a circle die to die cut both the panel as well as the card front making sure I open the card base while running it through the die cutting machine. I saved the two circle die cuts. 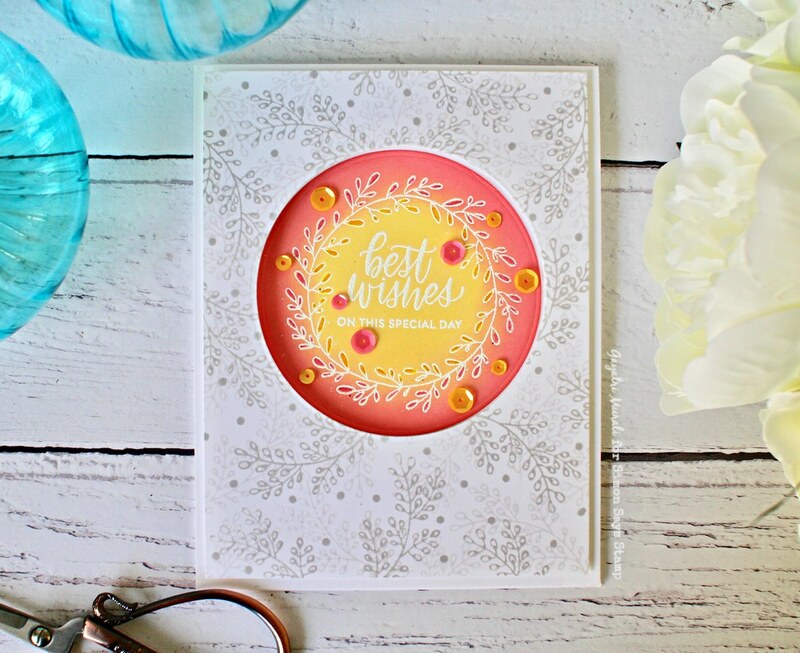 I white heat embossed the wreath and the sentiments from the stamp set on one of the circle die cut and sponged squeezed lemonade and worn lipstick distress oxide inks for emboss resist effect. I used copic markers in a darker shade of the two colours to colour in the tiny leaf spaces of the wreath. I then adhered this circle die cut on top of the other circle die cut for dimension. I removed the white card panel from the card base, and stamped the foliages from stamp set in smoke gray and fog dye inks. The fog ink is very subtle and the smoke gray colour give a bit more definition, colour and depth to the stamped images. I also used the dot stamp to fill in some of the empty spaces. I adhered this panel back on the card base using foam adhesives. Then I adhered the sponged sentiment circle die cut through the window into the inside of the card base. Then used some sequins in the same colours as the focal point to embellish. Here is the photo of the inside of the card. I love the delicate images in this stamp set. So beautiful. There are lovely sentiments are well in the stamp set. 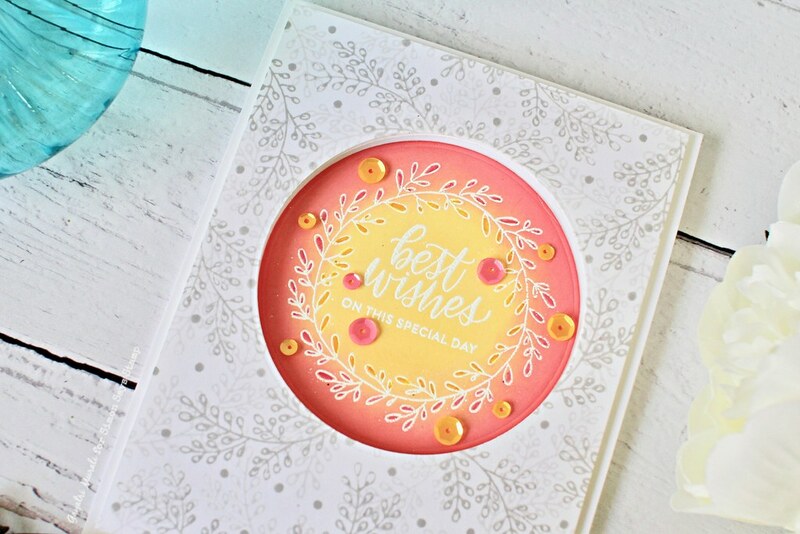 With the coordinating dies, the stamp set is wonderful to have in your collection. Hope you are inspired by my card. All supplies used to make this card are listed below. 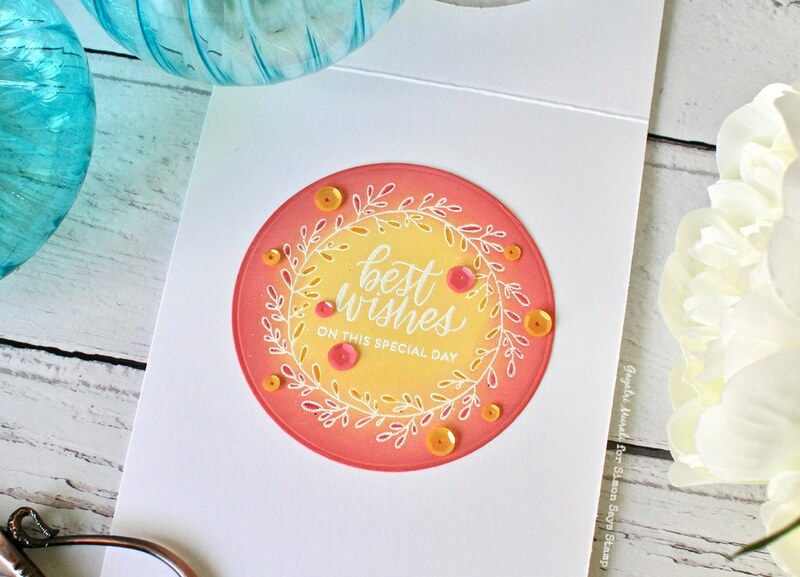 Nice use of twig/wreath stamping all over your card. I like the pop of color, too. Ooooh, this is so beautiful! Love the colors!